So you have made it through the first stage and it has only taken you around 4 months. The next step will often be a written exam or first interview, depending on the company the order is different and some companies leave out the written exam all together (my company and Tokyo Joe’s company both had a written exam but Joe’s didn’t). There are various kinds of written exams, personality tests, general knowledge test and specialist knowledge tests. The most famous of all of these is the SPI which stands for ‘Synthetic Personality Inventory’ which is a general knowledge test and the standard used by 1000s of companies. 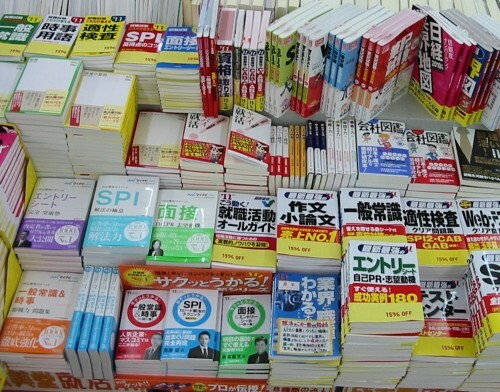 The SPI test generally has a math, language (Japanese and English) as well as personality section, but there are variations depending on who is taking the test (university grad, college grad etc.) and company that is using it. In essence it used to test not just a candidate’s academic level but also their general knowledge and character too. The most current version of the test is SPI3 which was introduced in 2012. The test can be done in both a test centers or on-line. These tests can actually be pretty demanding and there are a LOAD of books, websites and mobile applications devoted to just getting prepared for them. Often at Universities you will see hordes of students combining forces to tackle the tests. One person who is good at maths will do that section for everyone in the group, then another person will do the language section etc. Maybe not the most ethical way to do it, but definitely easier than trying to do it solo. This entry was posted in Job Hunting, Luke Palfreeman, Work and tagged applying to a Japanese company, find a job in japan, Interview, Job Hunting, setumeikai, shuukatsu, shuushoku katsudou, SPI, work in japan on January 10, 2014 by wijapanc. You might think that finding a new job is pretty much the same in any country. You generally find an advertisement for a job you want to do with a specific job description, listing the skills required for that position etc. You then send in a CV and Cover Letter highlighting your key skills and how they are applicable to what is required from the role. You will have an interview, usually one, maybe two at the most and if it is a specific skilled based job such as translation, some sort of work related ‘trail’. This is what I perceived ‘job hunting’ as and how most of my friends in the UK, America and other parts of Europe went about applying and getting their job. Also here in Japan, when you apply to most (not all) gaishikei (foreign company in Japan) it essentially follows the same pattern as above. My own internship application to Mercedes Benz R&D Japan followed the above process to the Tee. However if you are applying to a Japanese company, especially if you are going to be/are a new graduate, then the process is completely different and actually EXTREMELY confusing and long. Perhaps the biggest difference with ‘job hunting’ in Japan (called shuushoku katsudou or shuukatsu for short, cause shuushoku katsudou is a ridiculously long word!) is the fact that you are essentially not actually hunting for a ‘job’ but a ‘company’. The reason being that when you apply and are hired, you will often have no idea what job you will be doing in the company! Which makes it damn hard to sell yourself! Also most of the time when you are applying to a Japanese company it is under the assumption that you will work their for life, though more recently there is an increase in people changing jobs in Japan. So the average Japanese University student will start job hunting….wait for it…..at least a full 14 months before they are scheduled to graduate. Yep, talk about forward planning. The reason being that you have to jump through certain unavoidable ‘hoops’. Even if you are the most skilled, highly desirable candidate generally there is no way of avoiding this. So what does the average job hunting route entail? This entry was posted in Luke Palfreeman, Work and tagged applying to a Japanese company, find a job in japan, Job Hunting, setumeikai, shuukatsu, shuushoku katsudou, work in japan on January 6, 2014 by wijapanc.